In this ominous image, we see the dark vision of humanity that characterizes Goya’s work for the rest of his life. A man sleeps, apparently peacefully, even as bats and owls threaten from all sides and a lynx lays quiet, but wide-eyed and alert. Another creature sits at the center of the composition, staring not at the sleeping figure, but at us. 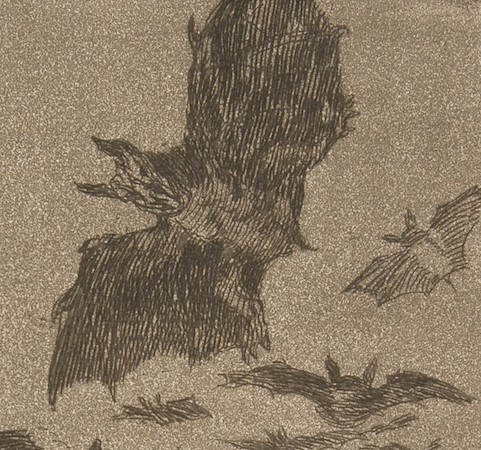 Goya forces the viewer to become an active participant in the image––the monsters of his dreams even threaten us. On 6 February 1799, Francisco Goya put an advertisement in the Diario de Madrid. “A Collection of Prints of Capricious Subjects,” he tells the reader, “Invented and Etched by Don Francisco Goya,” is available through subscription. We know this series of eighty prints as Los Caprichos (caprices, or follies). Los Caprichos was a significant departure from the subjects that had occupied Goya up to that point––tapestry cartoons for the Spanish royal residences, portraits of monarchs and aristocrats, and a few commissions for church ceilings and altars. The Caprichos was Goya’s most biting critique to date, and would eventually be censored. 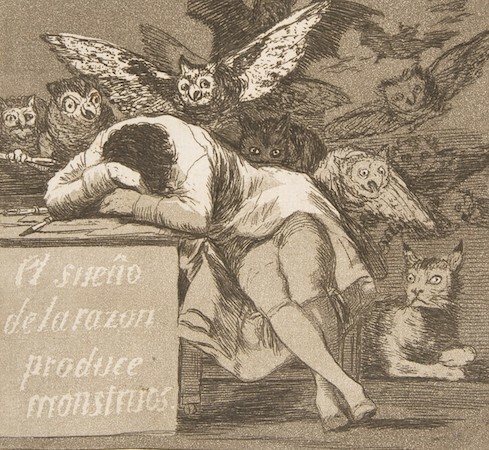 Of the eighty aquatints, number 43, “The Sleep of Reason Produces Monsters,” can essentially be seen as Goya’s manifesto and it should be noted that many observers believe he intended it as a self-portrait. In the image, an artist, asleep at his drawing table, is besieged by creatures associated in Spanish folk tradition with mystery and evil. The title of the print, emblazoned on the front of the desk, is often read as a proclamation of Goya’s adherence to the values of the Enlightenment—without Reason, evil and corruption prevail. In other words, Goya believed that imagination should never be completely renounced in favor of the strictly rational. For Goya, art is the child of reason in combination with imagination. With this print, Goya is revealed as a transitional figure between the end of the Enlightenment and the emergence of Romanticism. The artist had spent the early part of his career working in the court of King Carlos III who adhered to many of the principles of the Enlightenment that were then spreading across Europe––social reform, the advancement of knowledge and science, and the creation of secular states. In Spain, Carlos reduced the power of the clergy and established strong support for the arts and sciences. However, by the time Goya published the Caprichos, the promise of the Enlightenment had dimmed. Carlos III was dead and his less respected brother assumed the throne. Even in France, the political revolution inspired by the Enlightenment had devolved into violence during an episode known as the Reign of Terror. Soon after, Napoleon became Emperor of France. 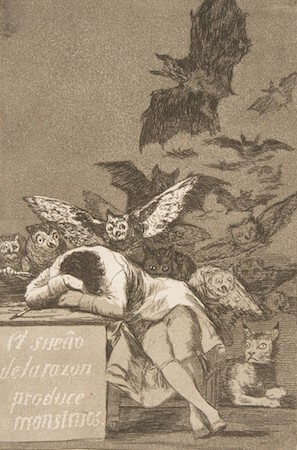 Goya’s caption for “The Sleep of Reason,” warns that we should not be governed by reason alone—an idea central to Romanticism’s reaction against Enlightenment doctrine. Romantic artists and writers valued nature which was closely associated with emotion and imagination in opposition to the rationalism of Enlightenment philosophy. But “The Sleep of Reason” also anticipates the dark and haunting art Goya later created in reaction to the atrocities he witnessed—and carried out by the standard-bearers of the Enlightenment—the Napoleonic Guard. Although the aquatint process was invented in 17th century by the Dutch printmaker, Jan van de Velde, many consider the Caprichos to be the first prints to fully exploit this process. Aquatint is a variation of etching. Like etching, it uses a metal plate (often copper or zinc) that is covered with a waxy, acid-resistant resin. The artist draws an image directly into the resin with a needle so that the wax is removed exposing the metal plate below. When the scratch drawing is complete, the plate is submerged in an acid bath. The acid eats into the metal where lines have been etched. When the acid has bitten deeply enough, the plate is removed, rinsed and heated so that the remaining resin can be wiped away. Aquatint requires an additional process, the artist sprinkles layers of powdery resin on the surface of the plate, heats it to harden the powder and dips it in an acid bath. The acid eats around the resin powder creating a rich and varied surface. Ink is then pressed into the pits and linear recesses created by the acid and the flat surface of the plate is once again wiped clean. Finally, a piece of paper is pressed firmly against the inked plate and then pulled away, resulting in the finished image. Cite this page as: Sarah C. Schaefer, "Francisco Goya, The Sleep of Reason Produces Monsters," in Smarthistory, August 9, 2015, accessed April 23, 2019, https://smarthistory.org/goya-the-sleep-of-reason-produces-monsters/.